Mr. George Sarpong is a lawyer, journalist, and recognized industry leader in media and communications policy in Ghana. 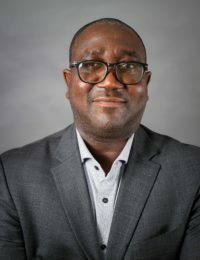 He currently serves as executive secretary of Ghana’s National Media Commission, which oversees more than 360 radio stations, 80 registered newspapers, 25 television channels, and various online publications. As executive secretary, he initiates and implements policies to ensure free, responsible, pluralistic, and diverse media and also works to address threats to media freedom and development. Before joining the National Media Commission, Mr. Sarpong served as coordinator of publications at the Media Foundation for West Africa, where he organized programs for the defense of journalists in West Africa. In 2001 he founded the Youth Network for Human Rights and Democracy (you-net) to train young Ghanaians in leadership and good governance, and in 2010 he set up the Party Youth Forum to foster peaceful cooperation among youth from different political parties. During his fellowship, George examined the implications of the transition from analog to digital broadcasting on freedom of expression and access to information in Africa. Central to his analysis was the role of the Chinese government in facilitating the technological transfer that digital migration requires, given the increased presence of China in the African media space. He offered insights into how regulatory policies could protect media pluralism following the digital transition.